First and foremost, we believe that people should have their own healthy teeth for an entire lifetime. It is now clear from both the medical and dental literature that dental health affects all facets of a person's physical and emotional well being. Your general dentist has referred you to us because he or she sincerely believes that your present condition requires the service of a specialist. We are an extention of your dentist's skill, care, and judgement. We offer expert endodontic care and we are specially trained to provide root canal therapy. It is understandable that you may be apprehensive about being placed in the care of a specialist. Let us assure you that should our evaluation indicate that root canal treatment will be of no benefit to you, we will openly advise you of this, and not recommend treatment. Our goal is to provide you with care that is as pleasant and concientious as possible. We highly value your opinion and would appreciate any additional comments or suggestions that you may have regarding our office staff and service. 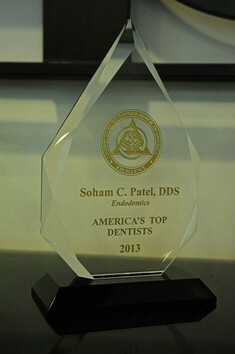 Dr. Soham C. Patel is a Maryland native who grew up in the Greater Baltimore area. He completed his dental education at the University of Maryland Dental School. 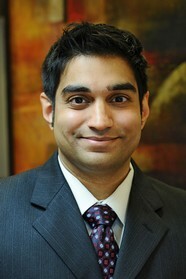 As a dental student, Dr. Patel was a member of the GORGAS and Gamma Pi Delta Honor Societies. After receiving his D.D.S. in 2002, he did a one-year general practice residency at the Veterans Affairs Medical Center in Washington, DC. He practiced as a general dentist in Bowie, MD for three years. An appreciation and interest in the field of endodontics led him to pursue specialty training at the New York University College of Dentistry. As a resident, he received an award from the AAE for his research work and contribution to the specialty of endodontics. After graduating with his Certificate in Endodontics, he returned to the state of Maryland. He practiced endodontics in Frederick and Gaithersburg before purchasing the practice of Dr. Steven Delgado in March 2015. Dr. Patel volunteers at events held by Mid-Maryland Mission of Mercy to provide endodontic care for the underserved. He is also an active member of the Carroll County Dental Society and the Edward C. Penick Endodontic Study Club. In his free time he enjoys cycling, golf, traveling, Baltimore Sports, and spending time with friends and family.